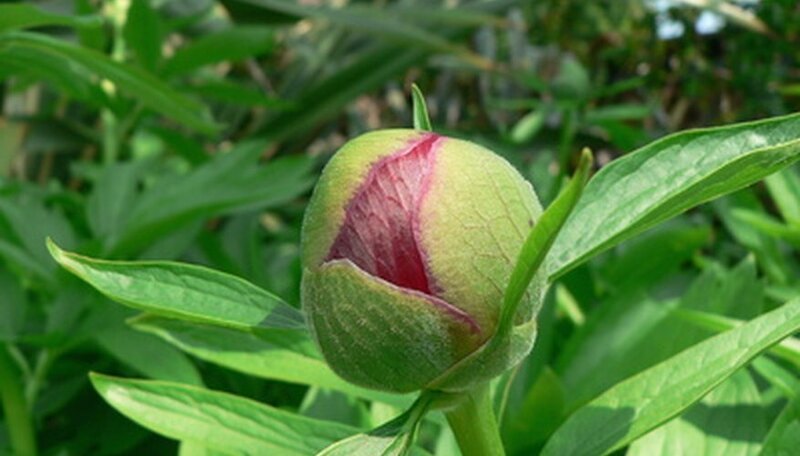 The stems of a peony bush will shoot up in early spring, producing round buds that open to large, fragrant blooms. The sun-loving perennial peony, which is cold hardy in U.S. Department of Agriculture zones 2 through 8, is as at home on the rural farm as it is in an urban garden. Plant peonies in groups of three or more for a concentration of color, or use peonies to create a hedge along a walkway or driveway. Caring for a peony bush in the fall is beneficial to the plant and neatens up the landscape. Cut the peony bush to about 3 inches above the ground after the first heavy fall frost and when the peony is dormant. The peony will usually be dormant by early October. Dispose of the cuttings to help avoid the spread of disease. Remove the mulch covering the ground around the peony. Leave the soil uncovered fall through winter. Peonies need exposure to cold to bloom the following spring. Throw out the removed mulch, which may contain bacteria. Dig up and divide a peony in the fall if it has become crowded. Peonies can also be divided to expand the peony garden, but only after the peony has been in the ground for at least three years. Divide the peony tuber into two or more sections, with each section having at least three eyes. The “eyes” on a peony root are protruding buds that will produce stems in the spring. The division should also have at least one root from the tuber. Replant immediately. Protect newly planted peony bushes their first winter by placing mulch over the plant. In the spring, brush the mulch away so the sprouts are exposed to the sun. Ants may crawl on peony buds. They will not harm the peony and will depart when the bud blooms.